The group constructs a shelter in the courtyard of the Prison using corrugated metal sheets and wood beams. The shelter is used as shade from the Sun and as a place where they can cook and have outdoor meals. But the shelter is also lined with gutters that feed several strategically placed 55 gallon drums. As seen in the photo above, they elevate the drums by placing them on drums that have been cut in half. The harvested rainwater is dispensed into 5 gallon buckets and used for drinking, vegetable garden irrigation, and laundry. Our comment: we see this set up all over the developing world. The corrugated metal sheets look pretty rusty but the water is probably still OK. However, three or four barrels won't be enough for the needs of the group later on when it grows in size. Isolated to the top floors of a Hospital Building, a group of police officers survive by growing food on the roof. 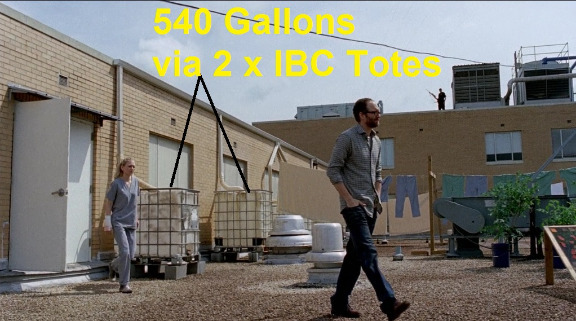 They harvest rainwater from one section of the roof thanks to gutters that feed two IBC Totes that are mounted on cinder blocks. Our comment: The IBC Totes are white, meaning that toxic algae will eventually develop unless they paint or cover the tanks. If the roof is asphalt, as is the case with most commercial buildings, the water will contain dangerous chemicals. 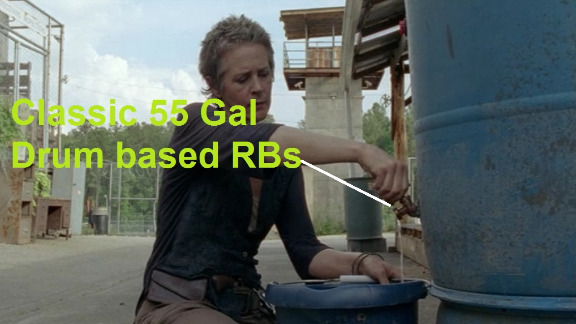 This water is clearly non-potable although the 540 gallons is probably enough for the group's size. 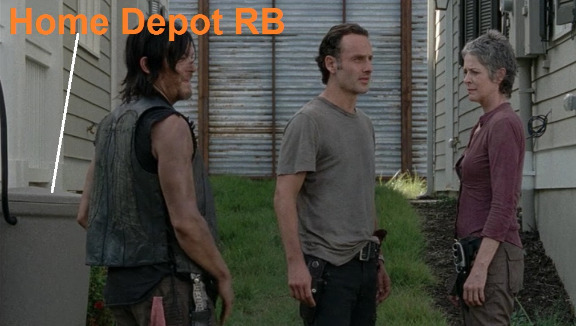 At her first interview with Rick Grimes, the Alexandria leader Deanna Monroe explains how the community was designed for sustainability. In addition to solar panels, "each home has a cistern", she says. Those cisterns turn out to be the 60 gallon Fiskars Salsa Rain Barrel systems you see at Home Depot. Such systems come with a diverter which has also been installed at the homes in Alexandria. Our comment: when Deanna said "cisterns" we though she meant underground 5,000 gallon tanks plumbed back into the home for water use throughout the home. But she meant rain barrels which does not equate to that much water. As discussed above, if the roofs are asphalt, the harvested water will have harmful chemicals. This "cistern" water is nothing we would want to drink "as-is". In conclusion it would appear that none of these cases are perfect. But we give kudos to the producers for trying to bring a dose of realism to the show. Rainwater Harvesting is one of the best Survival techniques when other sources of water are difficult to obtain- as often happens when you are under siege by the Zombie horde.